Exorcism in Catholic Church: Pope Francis says Satan, the devil, is real. How Pope Francis and the Vatican deal with the devil. 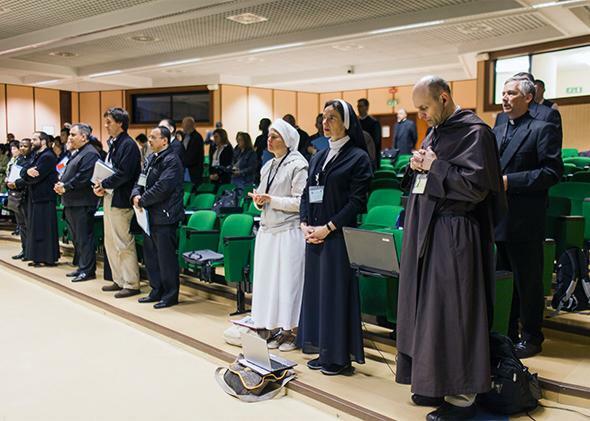 Participants of the Exorcism and Prayer of Liberation annual conference at the Pontifical Athenaeum Regina Apostolorum in Rome on May 5, 2014. During the conference, the Rev. Cesar Truqui, an exorcist based in Switzerland, recounted one experience he had aboard a Swissair flight. “Two lesbians,” he said, had sat behind him on the plane. Soon afterward, he said, he felt Satan’s presence. As he silently sought to repel the evil spirit through prayer, one of the women, he said, began growling demonically and threw chocolates at his head. In the photo gallery that ran online in the Post to accompany your story, it looked like there were a lot of young people at the exorcism conference. Anthony Faiola: We found that a lot of young priests, especially from Africa and Latin America, are interested in pursuing vocations in exorcism. They’re not officially exorcists yet, but most had some observational experience with exorcisms that had happened in their dioceses. It’s an incredibly hard thing in the Catholic Church to get an appointment as an exorcist. Some bishops out there officially buy into exorcism but unofficially don’t. The “ordinary,” the bishop or governing authority, has to appoint one, otherwise the exorcist can’t be considered official. What these guys are hoping to do is to break into the field. There are only about 500 to 600 exorcists worldwide, which seems to be a startlingly low number given how large the church is. But some dioceses are really upping their number, ostensibly because the bishops are seeing high demand—more people insist that they are possessed. The lesbian detail in the Cesar Truqui story seems significant. Was there much talk of gays and lesbians at the conference? AF: No. I had not heard others speak in that way. It was just an odd thing to pick out: How could he possibly know? He didn’t say whether or not they kissed or were holding hands. But he suggested they had pronounced themselves as being gay. This was in the middle of a talk, one of the lectures at the conference. Did he say how the story ended? Did he cast out their demons? AF: If I remember correctly, at some point in the flight, he stood up, looked at them, and they both looked at him with a look that he felt indicated they had been reading his mind. That was how he was communicating with them. He sensed a malevolent force and started praying—prayers for liberation, used to fight off demons—when he got chocolate thrown at him. At some point, he seemed to suggest, the confrontation stopped. On an enclosed airplane, there was only so much he could do. In addition, he wouldn’t have been able to do an exorcism on a plane at random. Exorcisms have to be sanctioned by a diocese. He couldn’t spring into action; he had to do a minimal level of prayer. It’s interesting: There are scales of prayers. Some prayers are considered outright exorcisms, others are used to ward off evil spirits in a less direct way. He was using one of those lower-grade prayers. How did you get permission to witness the exorcism? AF: It took some negotiating to see the exorcism itself, to get sanctioned to go see it. The exorcist has to get various permissions. Father Amorth is so senior that he takes it upon itself to make these decisions. He’s been press-friendly in the past. Stefano Pitrelli, an Italian journalist who helps us out in Rome, arranged our first meeting with Father Amorth. He accompanied me throughout the process and was really a huge help in getting access to the exorcism. Has a reporter ever witnessed an exorcism before? AF: I wasn’t able to find any other journalist who had done it before. I’ve been talking to Italian journalists who were shocked that we had actually been able to get permission to do it. Apparently there was one Spanish film crew that pretended to be members of the church who wanted to help out and filmed one. That was a big burn for a lot of exorcists. Most of them are just not very media friendly, with the exception of Amorth. They’re afraid of being mocked, and they’re just a little cautious. We had to get permission from the woman before the priest would allow us to observe the exorcism. She gave permission as long as we agreed to use her first name only and not cite her age or other details. She has two little kids. What was it like to witness an exorcism? AF: When we walked into the room, the priest was consoling her in the corner of this converted kitchen where all sorts of images of Mary and Jesus Christ were strung up. I didn’t get the feeling that the woman was uneasy because of our presence there. There were a couple of other observers in the room who were somehow associated with the priest and three helpers with him that day. It’s a bit surreal: At one moment he’s chanting in Latin, and the helpers are saying rounds of Ave Maria, so you’ve got an odd vocalization happening in the room. The woman was quiet for five minutes before there were any signs of metamorphosis. Then she started grunting, burping, coughing up phlegm, and her characteristics became more what you would expect in a movie. He started making the sign of a cross, and she was physically repelled from his touch. She was obviously made uncomfortable by any religious gestures. That’s when the drama really escalated: The priest asked, “What is your name?” calling the demons out. Making it answer questions is supposed to be a sign of the devil’s submission to the priest’s authority. He got the name Asmodeus. In the world of exorcism, there is only one Satan but many lesser demons. The priest asks several really arcane questions. His voice starts escalating, his gestures become more dramatic and reach some sort of a climax. She looked like she was ready to vomit. Gradually she regressed and came out of her trancelike state. The whole thing took about 40 minutes. Apparently she’s been participating in exorcisms for years? AF: I used to think exorcisms were just a one-shot deal, but they’re not at all. Apparently it takes years for these cleansings to happen. She said she started coming to the priest four years ago, when she was in the throes of her most violent stages. They told us it would take two or three men to hold her down. She was provoked by someone praying for her, or a church, or a religious object. Over four years, she has not been cleansed, not yet. But the demons have been greatly weakened, as they put it, so their power to influence her, in their minds, has weakened. AF: There would be critics who say she needs serious psychiatric help. She insists she has had that, but I can’t estimate how serious those evaluations really were. She also said that it took her a while to get permission to go to the exorcist, which goes back to the fact that not every bishop in the church embraces exorcism. How do you follow up a story like this? AF: I’ve been with the paper for 20 years, and this is probably my most bizarre assignment.